EMU's solar power array is the largest in Virginia. Harrisonburg City Council Tuesday night (Mar. 8) passed an ordinance offering a 100% exemption from local taxes for solar power installations, helping the city to join 13 other localities in Virginia that offer a 100% exemption for developers and homeowners to install solar power in their communities. The ordinance, passed by a four-to-one vote, exempts commercial solarpower equipment from the city’s machinery and tools tax while at the same time exempting residential solar systems from real estate taxes. Both exemptions last for a term of 20 years from the installation of any solar equipment. “Harrisonburg has indeed made a bold statement in support of solar power, helping to ensure that the leadership shown by the community in renewable energy can continue,” said Anthony E. (Tony) Smith, CEO of Secure Futures, LLC, which operates Virginia’s largest solar energy facility, located in Harrisonburg. Dr. Smith is co-director of the masters in business administration (MBA) program at EMU. 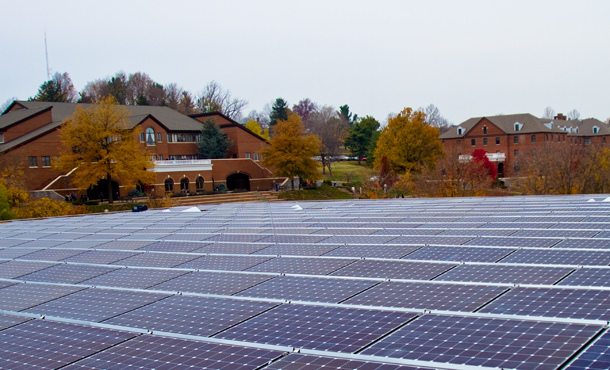 In fall 2010, working with Southern Energy Management (SEM) of Morrisville, NC, Staunton-based Secure Futures installed 328 high-efficiency photovoltaic panels on the roof of Eastern Mennonite University’s Hartzler Library. At 104 kilowatts, the system is the largest solar energy project built so far in the Commonwealth of Virginia. The new tax-exemption clears the way for Secure Futures and SEM to develop a second project at EMU of an additional 300 kW of solar panels on raised canopies on the north parking lot of EMU’s University Commons. “This ordinance could not have happened without the leadership from Council members who spoke in support, the commitment of EMU President Loren Swartzendruber, facilitation from state Senator Mark Obenshain and support from the dozens of citizens who showed up last night,” said Smith. Leading up to Harrisonburg’s Council vote, weeks of discussions took place among Council members, city staff, officials of EMU and Secure Futures, owners of residential solar power systems and concerned citizens leading to an idea for a partial or more limited tax exemption. The ordinance took final form only minutes before the City Council put the measure to a vote. “Council’s decision to amend the ordinance to provide a 100% tax exemption for 20 years was the right way to reward the buyers of solar systems for doing the right thing for the environment, even when there’s an extremely long payback period,” said Mitch King, board member of the Maryland-DC-Virginia Solar Energy Industries Association. In less than six months of operation, EMU’s solar project has already brought benefits to the city. EMU’s project brought in substantial funding to the area from outside sources including federal and state grants as well as private investment. If solar power becomes more widespread in the City, this could translate into lower costs for ratepayers since solar peak production in the summer coincides with the peak demand costs for the Harrisonburg Electric Commission, the city’s municipal power utility. By reducing demand for utility power generated by coal and other fossil fuels, the EMU solar project will eliminate more than 6,000 tons of greenhouse gas emissions over the projected 35-year life of the solar panels. Supporters say that the new ordinance will allow financial and environmental benefits to the city to increase in the future as EMU and others install more solar power. “Clean energy represents yet another means for strengthening the local economy and to help create jobs,” said Smith. Secure Futures, LLC designs, develops and co-finances distributed solar solutions with and for tax-exempt entities to reduce their electricity costs and to protect against future grid price increases through 15 to 25 year Solar Power Purchase Agreements (SPPAs). Secure Futures is based in Staunton, Va., and may be found on-line at http://www.securefutures.us.